Exactly as pictured and holds up well for being in my daughter’s room. Flat woven from 100-percent cotton, this natural carpet will add effortless, eclectic style to your space. The ivory pile is decorated with an intricate black, geometric pattern and fringed edges to complement your bohemian decor. Choose from four size options to fit any room. Design is printed, not woven. Ink smears when wet. This is an off-white rug with a printed design. The description does not specify that the design is printed. This is unfortunate because it will smear if you spill anything on it or rub it with a wet cloth. It also looks a little cheap. Otherwise, it's a cute rug, looks like something one would find at a popular hipster chain of shops. It has silver threads running through it, which I surmised by the word "sparkling" in the title. It wasn't smelly. Just sad about the printed design. I loved this rug at first but it has been down less than a year and is all stretched out and unusable. There are 2 layers to the rug. The top layer has stretched so much that the rug will not lay flat and looks horrible. To make it worse the black color on the edge of the rug has bled onto the carpet! Highly disappointing. I would not recommend. I bought this rug to go in my home office. Going for a feminine feel. The floor is dark wood and my office furniture is a light cream color. I bought the Linon Pamela Office Chair in white (really cream) and everything works beautifully together. There's a bit of a sparkle in the rug that adds some fun to the room. I actually saw this same rug on a blog that I follow which influenced my decision to get it. The design of this rug is gorgeous, but the sparkles are a little awkward. Also, the rug is very thin, so it's best to place a rug pad underneath it. It's a great little design though, and very neutral so will fit with most decor. I have mine in our music room, and I'm really enjoying it. This is such a beautiful rug. The pattern and fringe are so pretty. Note that “sparkly” in the description means that there are tiny silver threads running through it - not my favorite aspect of the rug - but not too noticeable to make me change my review. I love this rug....the metallic threads are subtle but add a little something special to the rug. I have this in a fairly conservatively decorated room - it adds a fun little pop. Love it. Don't try and clean by scrubbing. It does bleed. This is an absolutely exquisite rug! It does have the tiniest hint of a sparkle, but it's very delicate. I put this in my entryway and it has just brightened up the area! I've had it down for almost a month and despite being a high traffic area, it looks brand new. It is super low profile and vacuums right up! It's well made and pattern is perfect. Not a five because there is metallic thread through out the rug. Not visible in picture. I kept the rug anyway because I liked it well enough but would not have ordered if I'd known it. Was meant for a more rustic themed room. I just didn't catch the work sparkling in its description. So far we have had this carpet for about three weeks. It has help up well. We have a dog and a cat. The material is well made and sturdy. The slight shimmer accent is nice and blends in without being too much. Pleased with this purchase. 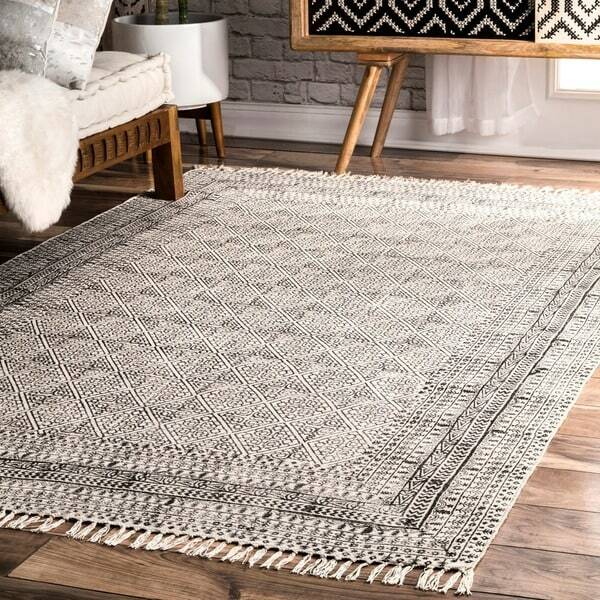 Option: Ivory - 8' 6" x 11' 6"
This rug looks beautiful in my living room against my dark wood floor. It's a bit on the thin side, but has a very upscale look to it. The pattern is very pretty and true to the picture. Really beautiful rug and looks much, much more expensive than the price. I love these rugs so much, but lease know if you get them wet at all the ink will run. Makes it very difficult to clean. The look is amazing and I wish I could buy these again, but with dogs it is not an option for me. Again, these rugs are amazing so get one! This rug has a sparkly threat running through it. Not at all what I expected. Makes it look cheap and decorative, rather than functional and complimentary. Worse, I now have to *** to return it. It's a risk you take, but I will not take this risk again and only shop with free returns. "Does this rug do well on wall-to-wall carpet? will it roll up or can someone trip on it, for example?" "Does anyone know where that mid-century modern table in the background is sold or available?" "Does this rug have any sparkle in it? Just curious because if the name, but I can’t tell from the pictures." It does not have sparkles. "Could the fringes be cut off"
This rug is not recommended for cutting. "Is the color Navy & Ivory?" The background color is ivory with black and grey detailed print. "Why does the description include the word "sparkling"? The product specs make no mention of any material that might have shine or sheen or glitter or other..."
This rug has a metallic thread woven through it which is probably why they call it sparkling. It's not overly metallic in person, very subtle.